A partially dry cavern, a small cenote pool and a tunnel passage into a larger cave where you can dive! The first pool for dipping. To access the large cave, you need to swim through the tunnel. 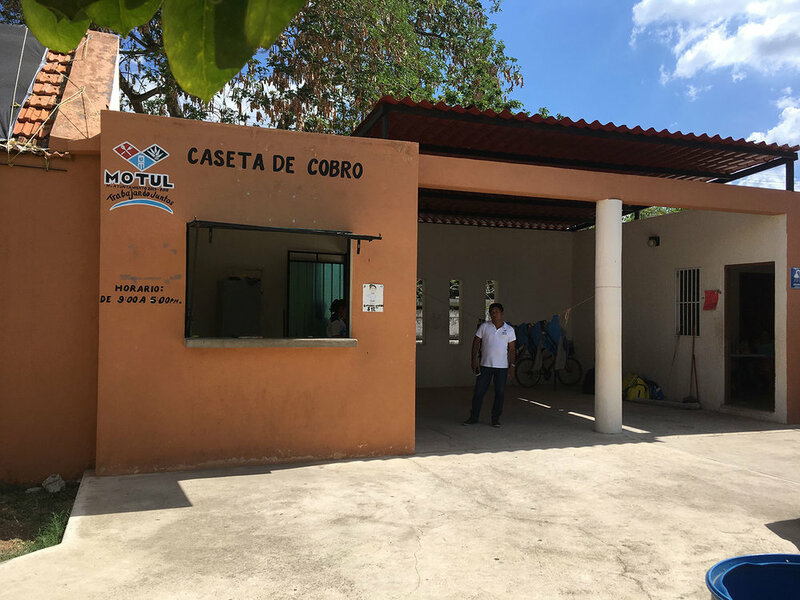 We visited the town of Motul and its cenote with my husband Rhod in May 2018. I did not try the tunnel as it looked spooky to me but for braver and more experienced snorkellers it is not a problem. Apparently the larger cave is 40m long, while the depth varies from 1 to 8m. On this occasion I did not even swim in the cenote; we just used the cave to cool off from the heat outside. 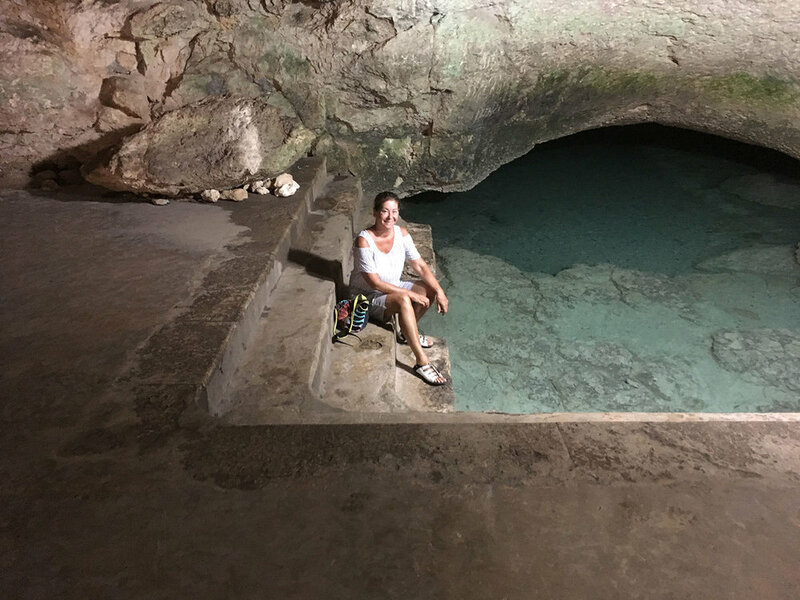 We walked about the zócalo of Motul town and were on our way to the hacienda San Jose Cholul when we 'bumped' into this cavern (on the way out of Motul). The tunnel leading to the large cave: seduma.yucatan.gob.mx. To enter the cenote, you go down a staircase to an illuminated room where you can leave your things; there are a few benches here for this purpose. On one side there is a dry cavern and the other side has the pool. There are cement steps leading to the first cenote pool, making the access easy (although not very natural looking). I suppose I prefer more rustic cenotes. I sat on the steps and cooled off my feet. While doing so I spotted some fish, which are common to most of the cenotes: catfish and mojarras. The dry part of the cavern has some stalactites lit by colourful lighting. The effects made it pretty but a little bit artificial. I tried to imagine it in ancient times, lit by real fire. Well, that is what I always do in the sacred Maya places; I try to imagine their life in ancient times. I am sure fire ceremonies would have been held here by the priests in the past. They made fire by the old method of fire-drill. In its simplest form, the fire-drill consists of a stick inserted in a hole bored in a piece of dry wood, while the stick itself is twirled between the hands and pressed downwards. Fire for the Maya was a living, breathing organism (the same applied to stones, for that matter). The ancient Maya fire drill method. Source: wikisource.org. The Maya were cave-obsessed. For their sacred cave rituals the Maya apparently ventured into deep spaces at great risk, sometimes swimming down subterranean rivers, climbing cliffs or lowering themselves into tight hollows, to find a perfect dark spot for the ritual. Archaeologists need ropes to access some of these places where the Maya worshipped. Motul was an ancient Maya city, said to have been founded in the 11th century by a priest named Zac Mutul (later ruled by the Ceh Pech dynasty). If you do venture to this cenote, try to imagine this priest or his successors performing a ceremony here. The dry side of the cave with the artificial lights. The caves were a sacred place of worship for the ancient Maya and indeed to go through the tunnel to a large cave would have encompassed their belief that the cenote was a portal to Xibalbá, the underworld. The deceased entered its waters to fight the lords of the underworld and if they defeated them, they would then proceed to heaven. Offerings were made to the gods, such as Chac, the rain god, who was believed to dwell in cenotes among other deities. Among the offerings to deities there would be small nuggets of copal; a round ball of pine sap, small bits of myrrh, frankincense, anis, sesame seeds (which crackle in a fire), flower petals, corn meal, sugar, cacao beans, ritual alcohol (pox, fermented corn or balché, made from the bark of a leguminous tree, soaked in honey and water), tobacco. An offering would also include the breaking of pottery. View of the entrance to the cave from the inside. But cenotes were also considered by the ancient Maya to be places where life was born and they were certainly a source of water for them. There is also a tree preserved inside the cavern, with its tree top presumably out in the open as only the trunk is visible inside the cave, surrounded by a curved cement wall. It looked to me like a 'captured' tree of life that the Maya consider sacred. The local tale says that a child was lost here in the past and that it is the spirit of the cenote. Another historical moment is tied with Felipe Carrillo Puerto, who was born in the town of Motul. He was a politician and revolutionary who became known for his efforts at reconciliation between the Yucatec Maya and the Mexican government after the Caste War. A plaque at the cenote garden states that he was having secret meetings in the cenote related to his political fight. A preserved tree inside the cave. The chimney at the entrance, the arched gateway and the large garden/jungle park indicate that there was a hacienda here in the past but none of the locals were able to tell me its name. However, there are other haciendas very nearby. One of them is Hacienda San Antonio Dzina, now open to the public for private events. It could have been the same estate in the past, and the chimney at Sambulá could have belonged to it; who knows. There were so many haciendas across the Yucatán countryside, near each other. It can be accessed via a dirt road at the back of the cenote. A bit further along that dirt road is Hacienda San Jose Cholul, where we went for lunch and a hacienda tour. However, it is too far away for Sambulá to have been a part of it in the past. In any case San José has its own chimney so that strikes that option out. 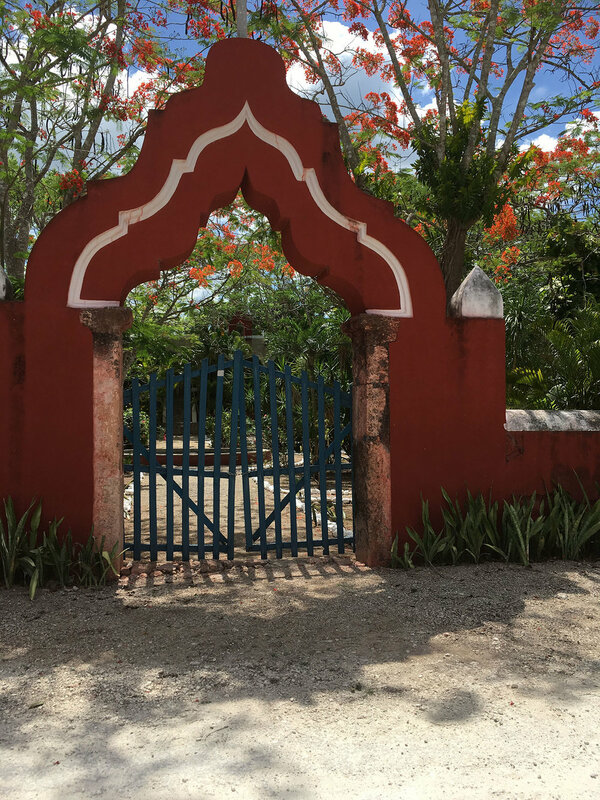 Entrance gate to Hacienda San Antonio Dzina; and the well on the right. The facilities in the Sambulá park are well-maintained and offer bathrooms, changing rooms, life jackets, showers, and a restaurant. There is also a huge park, with a football pitch, picnic areas and outdoor shops but they all seemed to be closed during our visit. It was not clear if these have just been developed and are going to open soon or if they were closed for lack of tourists. The shops are either closed or waiting to be open. The cenote is open from 9am to 5pm. The entry fee is 12 pesos, the cheapest entry fee to a cenote that I have encountered anywhere in Yucatán. But bear in mind that you first have to swim through the tunnel to get to the main cave chamber. It is a short tunnel but if this is not comfortable for you, than this cenote is not for you. You can rent life jackets at reception. To get to Motul from Mérida you have to take the Mérida-Tizimín highway, once on this road you will only have to travel 43km. The road is in very good condition and well marked. We came here from the Gulf of Mexico, and road 172 from Telchac; it is only half an hour's drive from there. From the centre of the city ten blocks to the south is the highway to Cacalchén. The cenote is on the way to this highway, at the street junction 41 x 24. You can hire a mototaxi from the centre to get here. It is a tricitaxi, a simple, fun and economical way to get from one place to another in all the small towns of Yucatán. 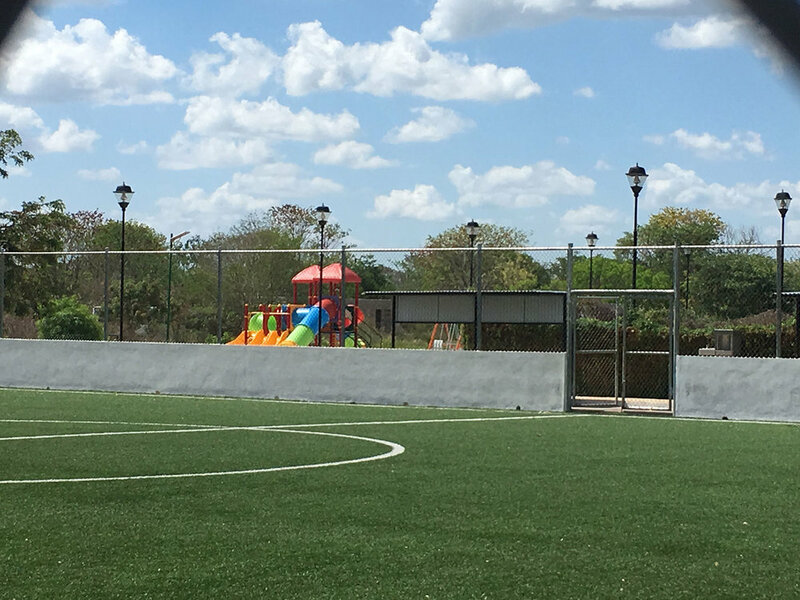 You can combine it with your visit to Motul town and Hacienda San Jose Cholul, just south of the cenote.